The “real contest” at the Mr. Olympia was the prejudging. It was a titanic battle between the monstrous marvel RONNIE COLEMAN and the ripped golden boy JAY CUTLER. Jay led by 6 points at the end of Rounds 1 and 2 – but Ronnie later posed his way to a very narrow 4 point victory. 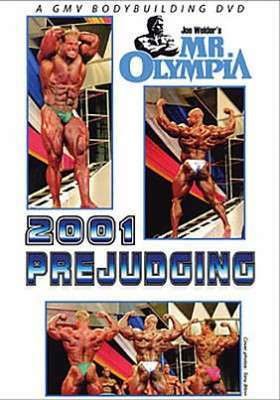 SEE THE MR OLYMPIA PREJUDGING FOR THE FIRST TIME EVER ON DVD! THE COMPLETE PREJUDGING of the 2001 MR. OLYMPIA!! The “real contest” at the Mr. Olympia was the prejudging. It was a titanic battle between the monstrous marvel RONNIE COLEMAN and the ripped golden boy JAY CUTLER. Jay led by 6 points at the end of Rounds 1 and 2 – but Ronnie later posed his way to a very narrow 4 point victory. Did Ronnie deserve to win? You be the judge. Jay Cutler came from nowhere to capture second place. We also saw one of the favourites in Chris Cormier go to 5th place and Nasser El Sonbaty drop to 9th place. It was an extremely exciting evening Finals show! This Prejudging DVD presents all the action from the solo poses of Prejudging Muscularity Round 1 and all the top guys shown in the ¼ turns of Symmetry Round 2. Includes all the excitement of the complete compulsory comparisons through to the final callout which was Jay versus Ronnie. The most exciting Mr. Olympia in years!! For the complete results scorecard, highlights of the performance and posedown rounds, athlete interviews and awards, see the 2001 Mr Olympia Finals DVD, A-1051DVD, click here. This DVD is the first ever offering of the complete Mr. Olympia Prejudging. 90 sweat filled minutes of awe inspiring muscle war. Shot by GMV Productions in association with Magna Media International. October 27, 2001 at Las Vegas, Nevada.